Daily Illuminator: This IS The Droid You're Looking For! March 28, 2011: This IS The Droid You're Looking For! 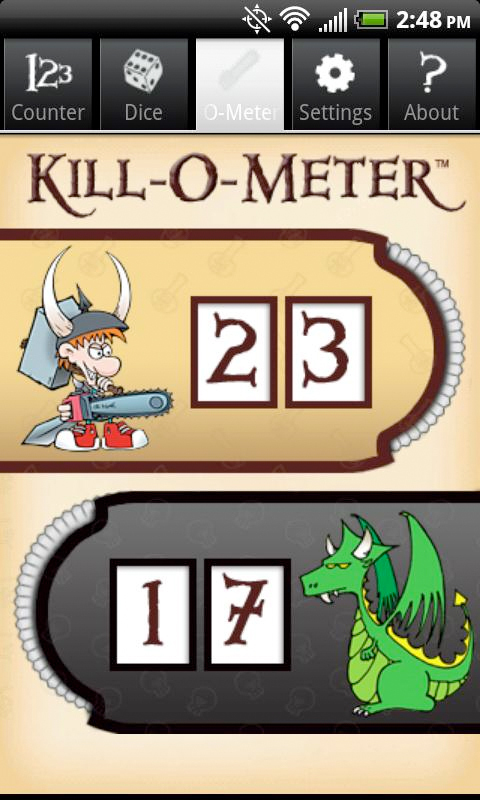 The long-awaited Munchkin Level Counter for Android devices is now available in the Android Marketplace. In addition to counting levels (duh) for Munchkin (regular and Epic) and Munchkin Quest, it has a Slack counter for Chez Geek, a Loot counter for SPANC, and a build-your-own counter for whatever nefarious purposes you can envision. But that's FAR from all . . . because the Munchkin Level Counter also includes Boons for Munchkin and Munchkin Quest. Boons are one-time-only bonuses that you keep secret until you spring them on your opponents . . . and the longer you wait to grab a Boon, the better it's likely to be! We've even included a d6 roller and a digital Kill-O-Meter, because true munchkins ALWAYS want to know how buff they really are. Our thanks to Jay Koutavas of Heynow Software, who worked long and hard to translate the iPhone code for use on Android devices. It wasn't a trivial job, but ever since the original iPhone version came out, we've been getting requests for ports, Android chief among them . . . and we think you'll like what Jay has done here.